Mr Realpolitik: Trump is POTUS..What happened? What happens next? Trump is POTUS..What happened? What happens next? Well. I didn't expect that. No one expected it. Donald Trump is president of the United States of America. He is the leader of the free world. A man who insulted literally every minority demographic, women, Muslims, Jews, you name it, is now POTUS elect. What does this mean? Well, for starters, it means that the old "Third way" of Bill Clinton and Tony Blair is on life support, if not dead totally. The whole electoral strategy of the third way was based on chasing wealthy suburban and urban voters, but abandoning white working class voters and those in rural areas. 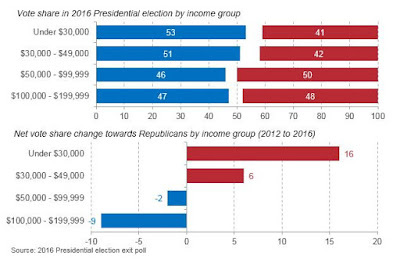 We now see the consequence of working class and middle class America being left behind by the establishment. Donald Trump achieved a 16 point swing with the low paid-and won key blue collar states such as Michigan, Wisconsin, and Pennsylvania. Hillary Clinton was the last serious champion of a managerial, economically liberal, establishment politics. A narrative has been festering since the election, encouraged by the same media establishment that could not predict Donald Trump winning, that all of those who voted for Donald Trump were racist and that his election was driven primarily by white supremacy. In reality, white supremacy does not adequately explain the shift that was described above. There is no doubt that a significant minority of Donald Trump supporters are indeed deeply sexist and racist, but also there are many thousands of voters in the U.S Rust Belt who voted for Barack Obama but this time voted for Donald Trump. It does not explain why these trends are being replicated all over the developed world, from the USA, to the UK with Brexit, to Spain with the rise of Podemos, to France where right wing populist Marine Le Pen may win the elections next year, to Australia where the populist One Nation achieved their best ever election result. All of these trends were driven by working people rejecting the establishment political parties and opting for something different. Something deeper is happening-a rejection of political elites and a rejection of a particular brand of social liberalism that has left millions of workers behind. The most striking statistic of this election for me was from the exit polls in Wisconsin, a rust belt state which Obama managed to win comfortably in 2012. Nearly 40% of those who voted for Donald Trump had a deeply unfavorable view of their candidate-but they still voted for him. Undoubtedly there were many who did not like his comments about Muslims/LGBT people/Women/Latinos/Insert minority group here, but still voted for him because they wanted change. That has to be recognised. What happens now is the ultimate question. I personally suspect that Donald Trump will likely U-Turn on many of his more extreme policies. He has already indicated that he would soften his positions on immigration, and the Muslim ban which he had proposed during the campaign. 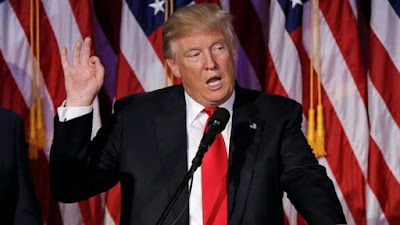 He is however likely to push his messages on trade, on economics and healthcare hard, and he will likely clash with the Republican establishment on many of these issues. For his part, vice president Pence is likely to push deeply regressive policies that will attempt to reverse many of the social gains of the Obama years, especially on abortion and gay marriage. The real question now is how the Democratic Party responds. The Democratic Party establishment is in disarray, and DNC chair Donna Brazille is likely to be replaced by Keith Ellison, who is from Minnesota. It is likely that the progressive wing of the party, who have blamed Hillary Clinton squarely for the loss of the rust belt, will try to take control of the party. Time will tell about how successful or not they will be. Many Democrats are already looking to blue collar populists for 2020, such as Sherrod Brown. Whatever agenda Donald Trump pursues, have no doubts that this is a very dark time for centrists and those on the left. All sides of both the British and American left need to seriously examine their appeal and message to blue collar workers. Otherwise, Donald Trump could win again in 2020, and that would be a disaster for America and the world. Serious thought is needed.